Aerial Refueling System Market size is estimated to surpass USD 3 million by 2024; according to a new research report by Global Market Insights, Inc. Rising implementation from military segment along with increasing defense budgets of numerous countries across the globe will primarily drive the industry over the forecast timeline. Various developing countries including China and India have witnessed substantial increase in their defense budget. This high defense budget has led to significant rise in the purchasing power of these countries, further escalating the revenue generation of aerial refueling system market. Probe and drogue will dominate the aerial refueling system market, crossing 70% volume share over the forecast timespan. Provision of more passive tanker operations as compared to flying boom mechanism along with negligible requirement of precise direction to the drogue will contribute significantly towards the revenue generation. Flying boom system will witness significant gains owing to its high usage in the industry over the past years. Moreover, high fuel transferring rate as compared to the counterpart will further propel the market size from 2017 to 2024. Rising demand for special purpose military jets coupled with introduction of multi-role tankers and extensive usage due to their benefits will also impact the aerial refueling system market positively. However, high instances of accidents during refueling may hamper the industry growth over the next eight years. Moreover, drawbacks of flying boom system such as compatibility issues with helicopters and high requirement of pressure reduction during refueling will further impact the industry negatively. Industry participants are continuously focusing towards R&D activities for overcoming the challenges of complex refueling procedures during severe weather conditions. Smart drogue system is an emerging technology that has gained traction among the aerial refueling system market participants. It is equipped with sensors and is connected to existing hose that constantly monitors the basket movements. This technology results in a significant reduction in its movement and acts as an active buffer. Moreover, it offers continuous refueling even in severe situations. These regular advancements are expected to instigate immense growth potential to the industry till 2024. Military aircraft will dominate the aerial refueling system market, crossing USD 2 million over the next eight years. It is attributed to high requirement of refueling system in military sector along with increasing defense budgets across the globe. Helicopters are likely to grow significantly from 2017 to 2024 owing to their high usage of these system. This extensive usage is credited to low fuel carrying capacities of helicopters. Continuous growth in their production across the globe will further strengthen the product penetration. Aerial refueling system market from refueling pods is anticipated to capture major revenue share owing to vitality of the component in the refueling system. They are responsible for monitoring the fuel transfer rate. 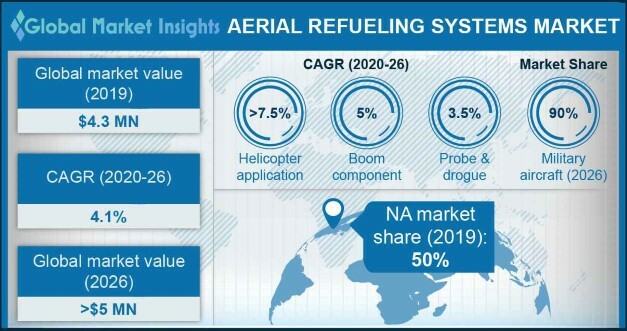 Drogues are expected to exhibit 3.5% CAGR over the next eight years owing to high adoption of probe and drogue system across the globe for serial refueling. Extensive usage in helicopters will further contribute to the segment’s growth. Aerial refueling system market from OEM will capture the maximum share in the industry over the forecast timeframe owing to prior installation in the aircrafts. Continuously rising aircraft production will further support the industry dominance. Aftermarket will witness 4.7% CAGR till 2024 owing to rising replacement needs of system components such as hoses, drogues, etc., especially for the ageing fleet. North America is likely to dominate the global aerial refueling system market with more than 50% revenue share by the end of 2024. Prevalence of multiple variants of these systems such as KC-135, KC-130 etc. coupled with presence of established manufacturers will primarily contribute to the revenue generation. Rising defense budget of U.S. will further support the regional dominance. Asia Pacific will grow substantially due to rising penetration in countries including China, Japan, and Australia. The high penetration is credited to high aircraft production across the region. GE Aviation System, Boeing, Eaton Corporation, Lockheed Martin, Zodiac Aerospace, Marshal Aerospace and Defense Group, and Dassault Aviation are among the noticeable participants in the aerial refueling system industry. Other prominent players include Omega Aerial Refueling Services, Northstar Engineering Corporation, Smiths, and The Liebherr Group. Agreements and contracts are among the major strategies implemented by the competitors to enhance their visibility. For instance, in October 2017, Cobham Plc signed an agreement with Icon Aerospace Technology for supplying refueling hoses for various aircrafts.